VAN GOGH MOVERS has been in existence since 1967. The company prides itself on quality service. 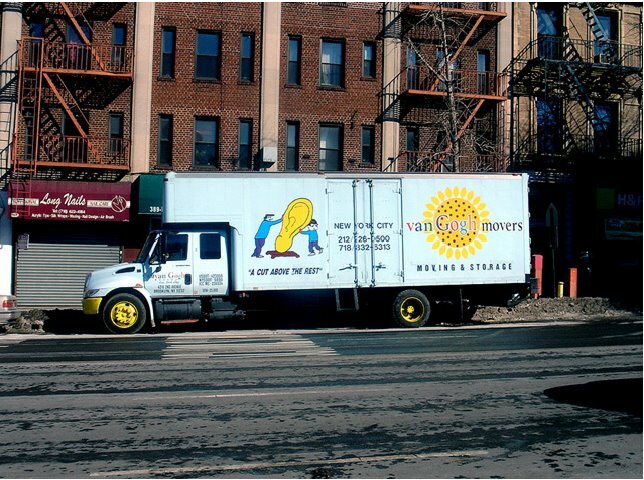 VAN GOGH MOVERS does very little advertising due to its large base of repeat and referred customers. Our jobs range from the single piece of furniture to packing and moving complete households, as well as commercial office moves whether you are moving across the street or across the world. From the beginning of your move to its completion, you will receive the Allied Advantage. This embodies all aspects of your move, from the pre-move planning phase to the unpacking and removal of your moving boxes. Your Vangogh personal relocation consultant will be there with you every step of the way. Our 47 years of experience as a moving company make us well-equipped to handle your next relocation anywhere in the world. Across the street or across an ocean, Vangogh can manage your upcoming move. As part of our unmatched moving services, we offer customized solutions for each type of move, whether it's local, interstate or international. Our worldwide resources and locations all over the globe give us the edge over other moving companies. For a stress-free, efficient move, trust Vangogh as your moving company. The Vangogh Advantage cannot be matched by other moving companies, and our wide range of moving services can be tailor fit to meet your needs. Our global network ensures that no matter where you're going, Allied can get you there. John and his crew were fantastic! Communication, professionalism, all five stars. They made sure nothing gets damaged and moved all our furniture out of a walk up brownstone very swiftly. Highly recommended! Just wrapped up my move and I couldn't be happier. The team was on-time, hard working, and professional. Arrived promptly at my apartment in DUMBO at 9:00 am and over the next 10 hours moved me to my new home in Park Slope. This was a complicated move. Pickup at one place, three drop offs in three states with stuff coming on and off the truck at one stop. They needed to move two pianos. They were perfectly organized. Wrapped and moved everything carefully. Got every single item to the right place. They were all cooperative and courteous. They gave us an estimate in advance and that was the final price. It was a pleasure to work with these guys! We scheduled our move approx. 1 month before the move and had several estimates. The quote I received from Van Gogh was by far the most thoroughly detailed one of the lot. When moving day came, the team was exactly on time and carefully prepped our high end furniture pieces including 61 pieces of art for the move. The team was hard working, respectful to our neurosis and got the job done in a timely and precise manner. When all was totaled out and the end of the day, the net price due was exactly 1$ off what I was quoted which was astounding. I would very much recommend Van Gogh. Thanks again for making our move super smooth! I have had both storage and moving service w/Van Gogh. This is my second move and once again I am very happy. The movers are on time, curtious and do a great job. John, Phil, and Andre were a great crew!